Well-preparedness is a must when you have an active and inquisitive puppy. We are usually on top of things, but one weekend we found ourselves out of town without any doggy treats. We made an emergency stop at a drug store for supplies. As was expected, they had a limited selection. 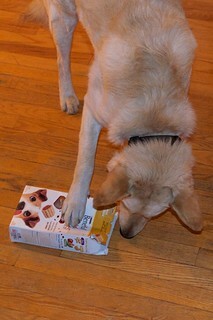 With only about three choices, we ended up with a box of Beneful Baked Delights Hugs. With around twenty ingredients, these treats were far from the usual natural treats we gravitate towards. On the upside, they did not disappoint with taste. Balki was “delighted” with them. We had to hide the box, because he became obsessed. Even as I write this with the empty box next to me, he has his eyes fixated on it. These little beef and cheese flavored crispy snacks really struck his fancy.